I completely winged Thanksgiving this year – literally hitting Whole Foods at 9am to pick up a myriad of groceries to use. 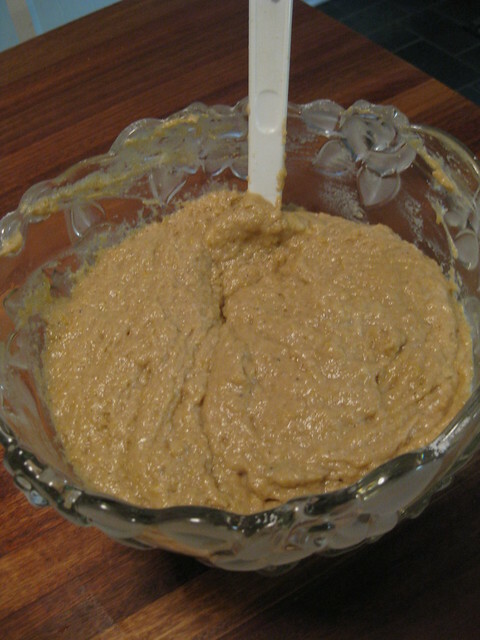 In the back of my mind, I knew I wanted to do some sort of seitan/soy roast, some mashed potatoes, and stuffing. Vegan stuffing – even though it seems such a simple thing to make – is annoying in that Whole Foods’ bags of stuffing are all full of meat flavoring. 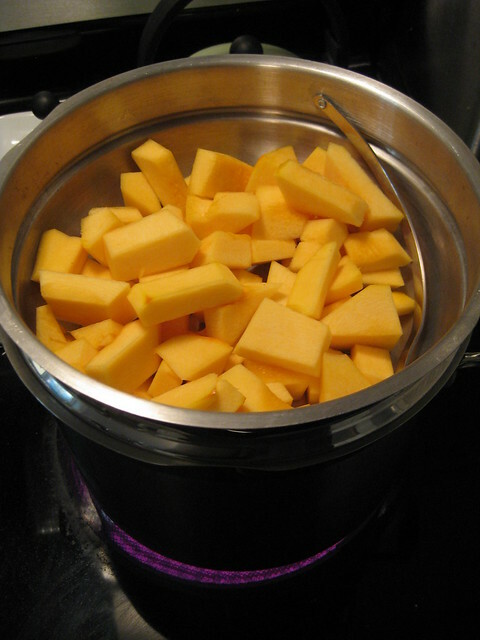 I could go to a local supermarket and pick up some nutritionally junky hydrogenated-oily stuffing cubes, but I decided to just make my own with bread, using this recipe I came across this week. Classic Sage & Onion Stuffing, from Elizavegan. I used a loaf of whole wheat bread from Whole Foods that was on sale for $2. 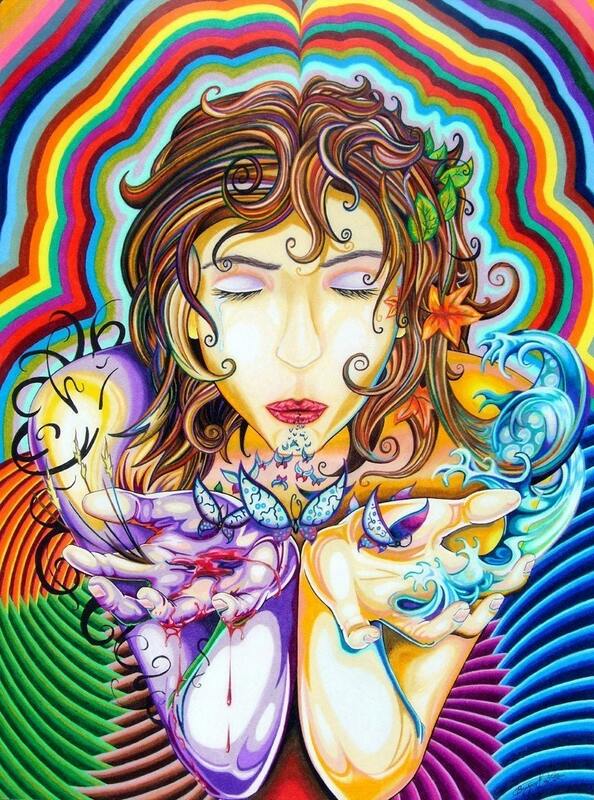 This turned out fracking amazing! Soy & Seitan Roast from Mac & Cheese. I wrapped the roast in yuba skin for the last 30 minutes of baking. 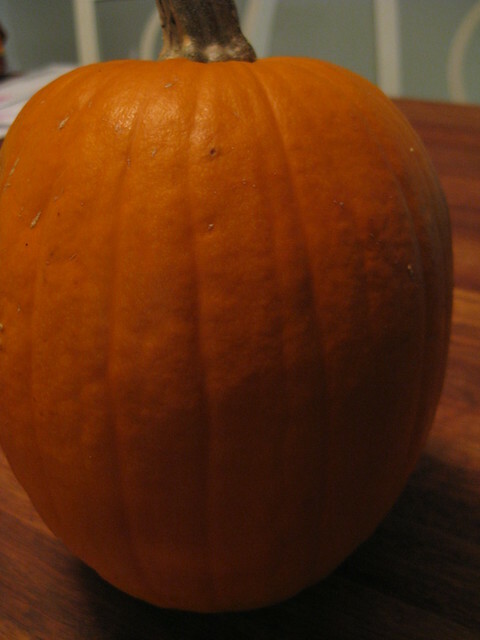 The texture and taste is pretty similar to a cross between Tofurky and the now-defunct Unturkey. I find the amount of chickpea flour used in this recipe to be a tad overwhelming flavor-wise; I’d probably cut it with some other high-protein flour (maybe soy flour) in the future. My plate of the roast, the mashed potatoes, stuffing, and extra yuba skin – topped with the gravy. One particular chain of bar/restaurants in Philly always fulfills all three of those requirements. I’m talking about the Royal Tavern and both Cantina locations (Dos Segundas and Los Caballitos.) The head chef at all three locations, Mark McKinney, does a splendid job of giving us vegans a plethora of delicious menu options. The recently revamped Khyber Pass Pub is the 4th, and possibly the best of the bunch in my humble opinion! The new Khyber has replaced the music floor with dining tables. They now boast 20 tap lines and 2 hand pumps for cask-conditioned beer – everything from local favorites like Yards Philly Pale Ale or Victory Storm King to West Coast IPAs like Ballast Point Big Eye or Port Brewing High Tide. And the food menu – still in “preview” mode for now, is Southern-style, with a bunch of vegan options. Normally I’d go with seitan po boys or the veggie sausage sandwich – two mainstays on the still-new menu. On this evening, however, I chose to start with one of the daily specials: Vegan Sausage & Mustard Greens Soup. The soup was very hearty and tasty. The sausage reminded me of the vegan chorizo you can purchase at Whole Foods or Trader Joe’s. The greens and tomato broth complimented it well. 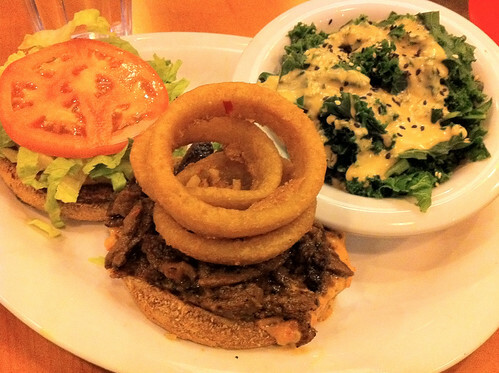 For my entree, I chose to go with the Vegan Pulled Pork Sandwich with a side of mashed potatoes and gravy. The pulled pork sandwich itself was a soft bun surrounding a mound of slightly sweet but also tangy seitan covered in some sort of cole slaw. I’m not a big cole slaw fan – in fact, I don’t like most white, veganaise-y things, but even I found this to be delicious. I was too stuffed between the beer and food that I had no room for dessert. They do offer cakes from Vegan Treats in the event that I ever leave room in my stomach during a future visit. Previously, my go-to, never-dissapoints, vegan-friendly Philly pubs were Local 44 and Memphis Taproom, but I now have to make room for a third. (It also helps that the Khyber Pass Pub is merely 2.5 miles away from my house, making for a pretty pleasant walk through Philadelphia.) I highly recommend it to any vegans looking for hearty pub food and a few tasty pints. Last week, somewhat on a short-scheduled whim, I decided to visit Los Angeles. I’ve only been California once before in my life (San Francisco) and don’t travel too often. 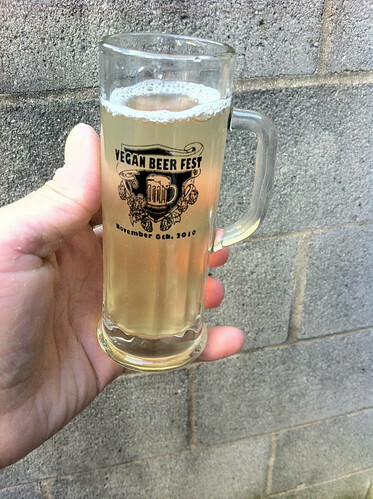 But I’ve been drooling over the pictures & reviews that quarrygirl has been posting for a while now – and when she decided to put together a Vegan Beer Fest – complete with food & bands, I found the perfect excuse for a trip. I left work early last Thursday, catching an early evening flight from Philly which would put me in LA around 9. Upon arriving & getting my rental car, I hit my trusty HappyCow VeginOut Guide app to see what was near the Airport and still open. VeggieGrill was the winner! Side note: I wrote the app, it is available for Palm webOS devices (Pre & Pixi) and will use gps to find nearby veg eateries. VeggieGrill is nothing sort of amazing. An all-vegan fast food chain in California (4 locations with a 5th coming soon), the menu (affordable wraps, burgers, salads, soups) is precisely something we’re lacking here in Philly. The space is bright & clean, the employees were super-friendly, and they also serve beer and wine. First up, I had the Chill Out Wings. 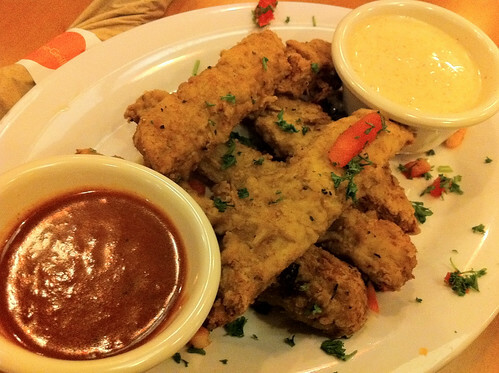 These are about a half-dozen seitan tenders in a slightly flakey batter, served with tangy BBQ sauce and a mild-tasting white sauce. They reminded me somewhat of the Tender Tiger from Vertical Diner in Salt Lake City. I’m not a huge fan of ranch / vegenaise types of sauces (though they are growing on me, slowly) but the blend of these two sauces made for a very flavorful appetizer. My main course was the All-American Stack: grilled veggie steak, thousand island dressing, pickles, lettuce, tomato – topped with onion rings on a wheat bun. The sandwiches & burgers at VeggieGrill come with cabbage slaw or chili as a side, but I opted to upgrade to the Steamin’ Kale. This sandwich was mighty tasty – a combination of things I would have never thought to compile on one bun, but it worked well. I wasn’t a huge fan of the kale, but that’s mostly my fault – it comes topped with a ginger-miso dressing, and I kind of sort of hate ginger. On Friday, after an early morning 6 mile run through Beverly Hills (which was a few blocks east of where I was staying), I decided to haphazardly hop in my rental car and see some sights. Most people would, say, go to a museum, or some park or monument. Me? I wanted to geek out on some TV-land stuff. 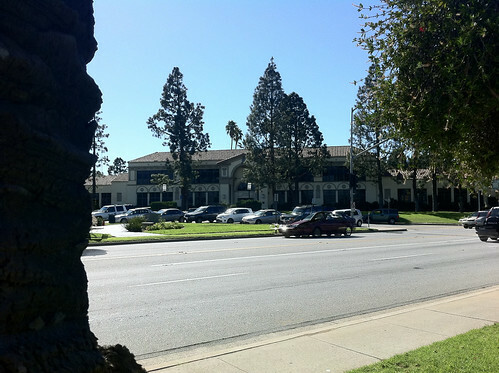 First up: the city of Torrance. This is Torrance High School. Why is this a worthy sight you ask? Well, the exteriors for lots of high school tv shows & movies were shot here. Amongst the ones I care about: She’s All That, Beverly Hills 90210, and Buffy the Vampire Slayer. I drove around the back – which had better, more memory-jogging visuals, but decided not to take any pictures of that, on account of trying to not look like a creepo taking pictures of high school kids. 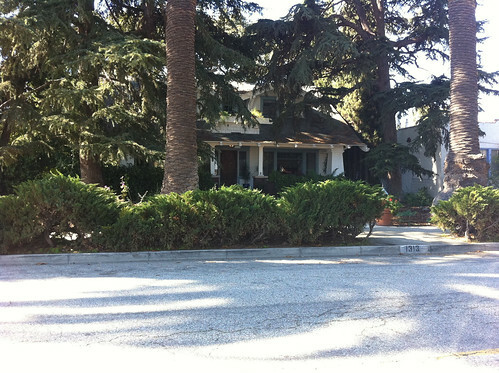 Just a few blocks away from the high school… Buffy Summers’ house! Exteriors for Buffy’s house were shot here. Call me a dork, but I found this to be very.. cool. Hunger was getting the best of me, so I decided to head towards the coastline and take a little trip to Hermosa Beach. When my wife visited LA a few years back, she raved about the food at The Spot, especially the Tofu Savory Sauce. 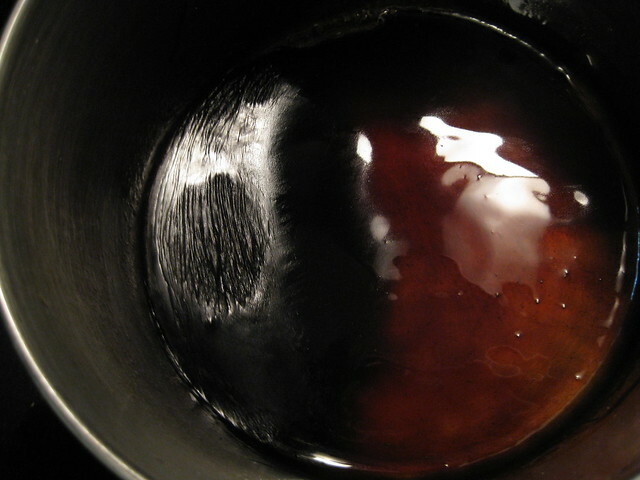 Note: the recipe can be found here; it is pretty spot-on. Hah! 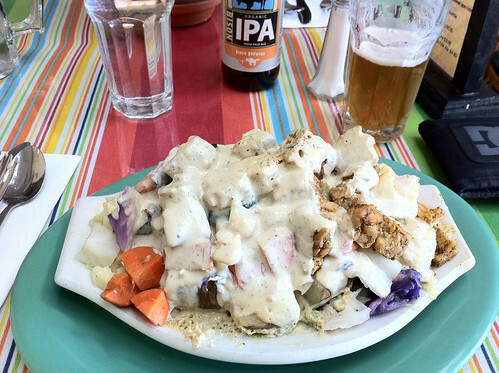 I opted for the Savory Spud – a huge potato, topped with veggies, tempeh, and the savory sauce. This was a beast of a meal – very filling – and very tasty. I found the seasoning on the tempeh to be a little oft-putting (perhaps it was too much cumin?) – but overall, thumbs up. I paired this dish with an organic Bison IPA, which worked well. After filling my stomach, I hopped back in the car, turned north and drove to Venice Beach. 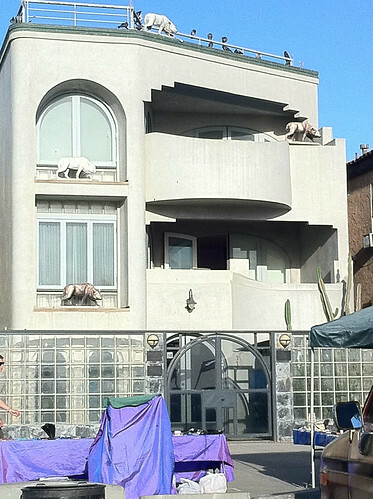 Venice Beach is a weird place. Really weird. The house above was MacGyver’s season 1 residence (it is now a law firm.) I was too early for the Green Flash Happy Hour at the Venice Ale House, so I decided to just walk around. Wow! Venice Beach is a generally pleasant place, but it was filled with hippies, gypsies, people selling all sorts of crappy art, junky rocks, etc. I even saw someone selling twigs labeled as “magic wands.” I witnessed the police rolling up onto the boardwalk (well, really a paved path along the beachfront) to stop some sort of food fight. I also passed one of those “come in, let’s diagnose your achy knee and get you some weed!” cannibus clubs – which just seemed and felt weird. On my way back to LA from Venice, I stopped in at the Venice Whole Foods. I always like visiting Whole Foods in other cities – always hopeful that I’m going to come across some crazy local or regional vegan product or food that I can’t get back home. Brett and I once spent close to two hours combing every aisle of a Whole Foods in Boston! 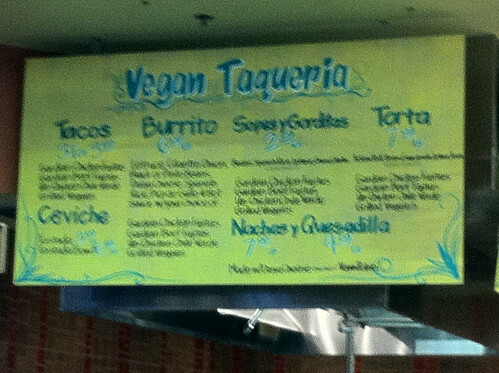 I bought no food, but I got a picture of their Vegan Taqueria sign, which seemed pretty cool. I also picked up a bottle of Lost Abbey Older Viscosity for sampling later that night. It is liberating to purchase craft beer in your supermarkets; I look forward to the day when this is the norm in Pennsylvania. Older Viscosity is one of my favorite barrel-aged beers; a blend of a hybrid stout/barleywine aged in Bourbon barrels for 1 year. It was the perfect beer to gently coax me into sleep that night. I purposefully skipped dinner Friday night, knowing that I needed to prepare space for the food and beer I was going to consume on Saturday. Saturday started with a very hilly 10 mile run through Beverly Hills, Brentwood, Westwood and other surrounding areas, then a walk up to Sunset Boulevard for the Fest. I was excited, but also nervous at the same time, on account of never having actually met any of the LA vegans I follow & interact with on Twitter. I’ve been to at least a half-dozen beer fests in the past few years and this ended up being my favorite out of all of them. 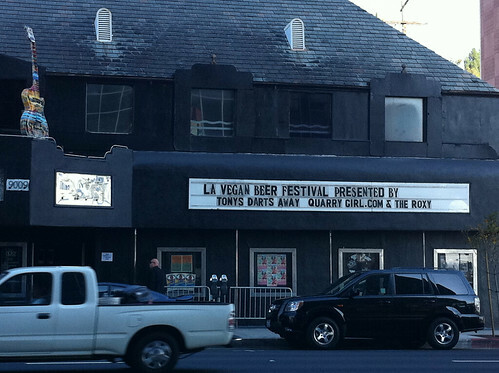 The fest was at the Roxy Theatre on Sunset in West Hollywood. It is apparently a somewhat famous club and has hosted a ridiculous amount of famous bands & comedians over the years. VIP ticket holders were treated to an hour pre-fest of beer in the upstairs bar, called On the Rox. This is the very bar where John Belushi apparently partied the night he fatally od’ed. At the bar they were pouring a few beers from Maui Brewing, and a triple IPA from SpeakEasy called The Don. Potent at 11%, but deliciously incorporating several of my favorite hops (Summit, Centennial, Amarillo) – this was a winner. There were several LA-area food trucks serving food at the fest: The Frankenstand (vegan sausage cart), Yalla Truck (falafel), Fresh Fries, Mandoline Grill (Vietnamese), SeaBirds (vegan burgers/tacos/burritos), and Doomie’s Home Cookin. I sampled from 4 of them. 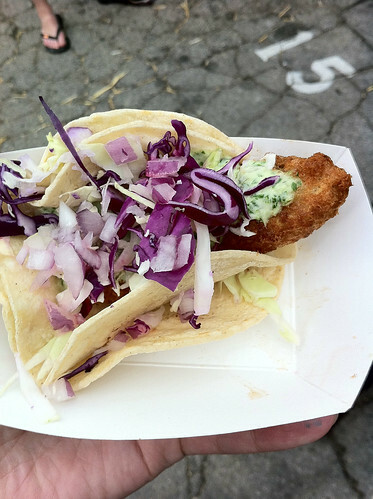 The first dish I helped myself to was the Beer-battered avocado tacos from Seabirds. I’m not sure if words can properly describe how awesome these were. The avocado pieces melted in your mouth as you bit in. Simply put: these were amazing. In fact, I showed this picture to one of my Philly friends when I got back, who happens to be a huge foodie & server at some of the top notch eateries in town. He was so impressed that he turned around and showed it to one of his chefs, who has interest in trying to do something similar. I know I certainly will be trying to make something similar soon! 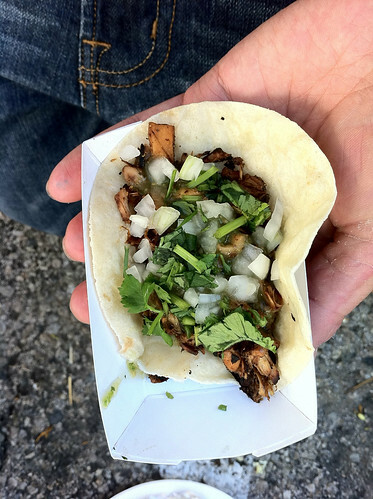 Seabirds also had a Jerk Jackfruit taco which was pretty high on the awesome scale. If you aren’t familiar, Jackfruit is a very “fleshy” fruit. The Memphis Taproom, in Philly (my favorite vegan friendly bar in the world) – has jackfruit “crab” cakes which are great too. If you see vegan jackfruit based dishes, don’t hesitate to give it a try! 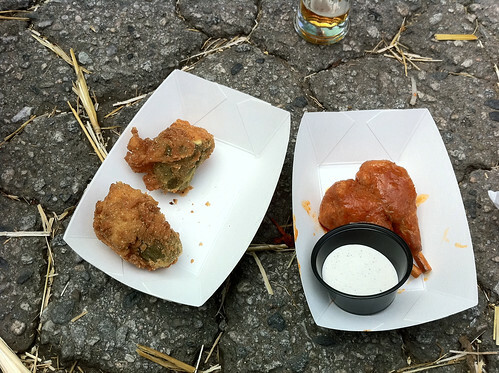 Doomie’s stepped up with jalapeno poppers and hot “chicken legs.” I’ve actually never had jalapeno poppers before in my life, so my comparison baseline is nonexistent, but these were great – hot, crispy, and oozing with saucy cheezy goodness inside. The legs were solid – I certainly wouldn’t refuse them, but I suspect they were May Wah based, so they’re pretty standard to the wing-type offerings that most cities have. Doomie’s also had cupcakes topped with icing that utilized Maui Brewing Coconut Porter. I did not get a chance to try them, but I wish I had. I saw many people chomping down on the chocolate covered “bacon” they had – I skipped it because the combination didn’t really appeal to me. The only other food I sampled were the “Vampire Repellant” fries from Fresh Fries. They were topped with minced garlic. This combination was very tasty, but i was pretty full at this point. I had hoped to chronicle each and every beer I tried, but that gets tedious after approximately 1 beer. I mostly sought out stuff I couldn’t get back home. Without question, the beer I was most blown away by was Eagle Rock Solidarity Black Mild. I’m always intrigued by full-flavored session beers, and this was no exception. Malty, roasty, and under 4% ABV; I wish more breweries did styles like this. I departed the fest very full, buzzed but not drunk, and overall very happy. It was a very well-behaved fest, full of friendly people chilling out. 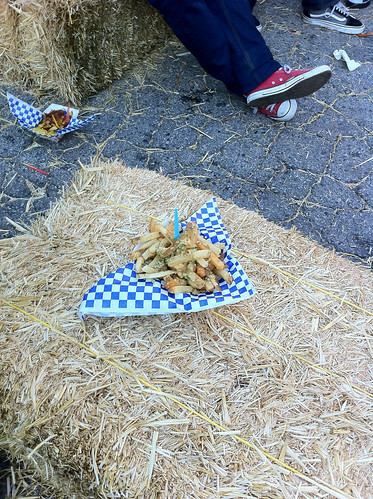 Having such an array of awesome food was such a welcome change for those of us who resort to eating like birds at most beer festivals. I slept like a baby Saturday night. I woke up Sunday well-rested and looking for more epic food adventures. After a quick 4 mile run to get my juices flowing, it was off to Madeleine Bistro – the area’s premier upscale vegan eatery. The one negative off the bat: the restaurant is in San Fernando Valley (is this the geographical container for the females that Frank Zappa spoke of in “Valley Girl”?) which is a bit of a haul. Luckily the freeway was pretty clear on this Sunday morning. Next up: Chicken-fried seitan over mashed potatoes with waffles. This was a home run, folks. 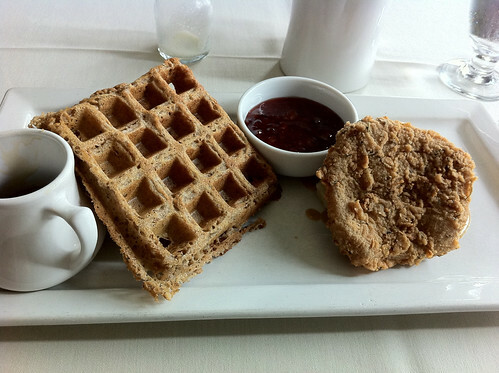 I was a fan of the beer battered seitan and waffles that are available in Philly at Mi Lah‘s weekend brunch, but this particular dish blows that away. The seitan itself reminded me of of the cutlets that came in the “Singing Cowboy” at the no-longer-existing Veggie Works – certainly doable at home with some practice – but hard to make consistently good. The seasoning & spices in the coating were superb. I do, however have two complaints with regards to this dish: the waffles crumbled too easily (literally fell apart when I cut off a piece to eat) and there should have been 2 pieces of seitan. At this point I was fairly full, but still wanted to try more food. I decided to order a slice of the cheesecake, and a donut. I cannot possibly describe the look of disgust that my waitress gave me as I ordered these additional items to stuff into myself. 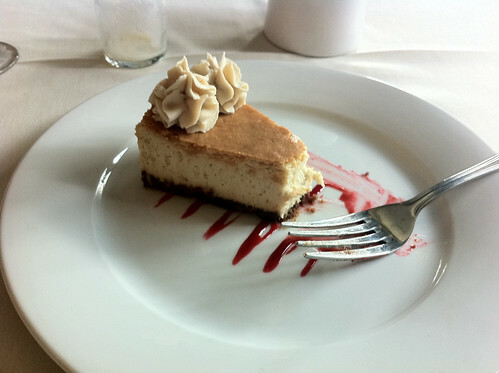 The cheesecake was solid but not spectacular. I’m a huge fan of Vegan Treats, which can be found all over the place locally, and I think they do a better cheesecake (not to mention, they make literally dozens of different flavors/types.) The $12 price point for a slice is mildly absurd too. I took the donut to go and ended up eating it later that night. Though it was not a traditionally-shaped hole-in-middle type, I still devoured it and enjoyed it enough to declare it the best vegan donut I’ve ever consumed. Eventually I got hungry again (this happens every 2 hours or so for me.) While waiting for The Surly Goat to open, I walked up to VeggieGrill’s location on Sunset for some grub. 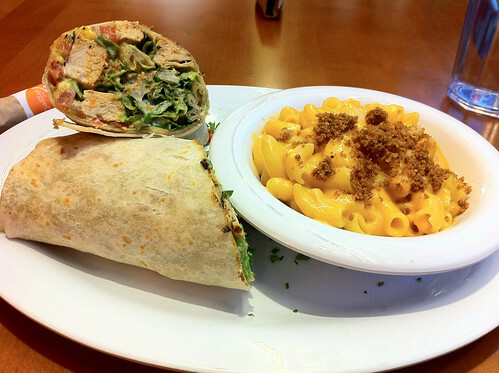 I went with the chick’n caesar wrap with a side of mac-and-cheese. Undoubtedly, this was the best wrap I’ve had in my life. The mac-and-cheese was very good, though a tad bit on the sweet side. Bonus: VeggieGrill CEO Kevin Boylan was walking around handing out free cookies to all patrons as a thank you for visiting. Awesome! After my meal I walked back to The Surly Goat, a West Hollywood beer bar. Besides having the most awesome bar name ever, I was blown away by the beer offerings. Immediately I knew I was in trouble: there was just too much to sample and I just had to try as much as possible. 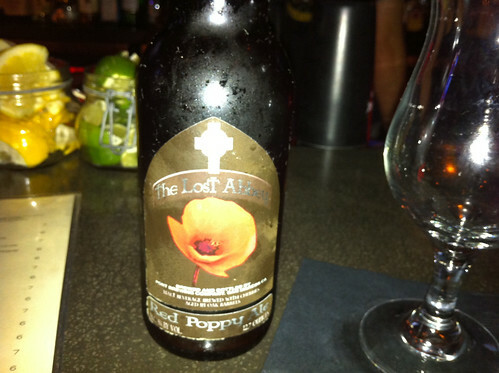 Red Poppy, from Lost Abbey, is one of my favorite sour beers. It is a Flanders Brown (oud bruin) aged on sour cherries & an extreme rarity in Philly. If you like sour, funky beers, this is a must try. 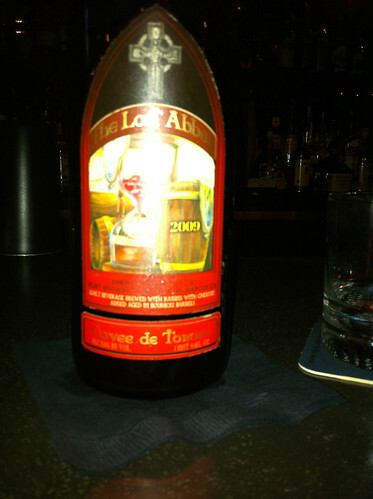 I also saw Lost Abbey’s Cuvee de Tomme on the bottle list. This beer is an 11% Belgian Brown Ale aged on sour cherries in a Brett-innoculated bourbon barrels. It is truly a one of a kind beer (it is usually very tough for beers that high in alcohol to sour this dramatically.) I had it once before: Brett & I split a 375mL bottle last year. Unfortunately this was a 750mL bottle. Though I shared some with the bartenders, this proved to be the last beer I could handle for the evening. I ordered the breakfast burrito with an avocado addition. 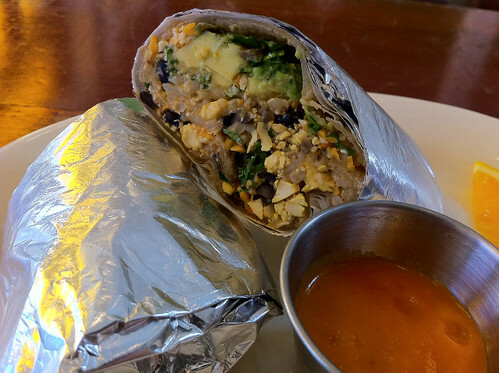 The brown rice wrap bundled up an inviting mixture of tofu, black beans, brown rice, kale, & vegan cheddar cheese. It came with a side of a spicy chipotle sauce, which had a very citrusy element to it and really helped the flavors of the burrito to pop. For my final meal in Los Angeles, this really hit the spot. Los Angeles was a blast. The weather was pleasant, the palm trees were plentiful, I made some new friends and got to sample & savour a ton of awesome food and beer. I look forward to returning some day! Thankfully, you don’t even have to go that far. For this VeganMofo contribution: a long-overdue review of the only all-vegan restaurant anywhere near Albany, Garden Cafe on the Green in Woodstock, NY. Visits to Garden Cafe typically follow a day of volunteering at Woodstock Farm Animal Sanctuary. That is, on the days that we don’t reek of chicken poo! The restaurant is located in the heart of downtown Woodstock and offers an excellent view of the happenings on the Village Green from its garden patio seating. It’s open every day, except Tuesday, though I believe the hours change seasonally. Check the website for current hours. The good news is, Garden Cafe is always busy, serving up cruelty-free, organic meals. The bad news is, Garden Cafe is always busy! No worries, we’ve never had to wait long (if at all) for a table, especially when the patio is open. The daily specials rotate, though most “specials” are items that can be found on the regular menu as well. The exceptions to this typically are truly exceptional, and a bit pricey (around the $20 range). The menu also allows for cheap, simple eats with make-your-own bowls (using a list of grains, greens and beans/tofu/tempeh) and a variety of delicious sandwiches, salads and quesadillas made with Daiya cheese. Last weekend, a friend of the spiritual, new agey persuasion was in town, so Jaime and I took her down to Woodstock for some groovy shopping and dinner at Garden Cafe. What follows is a description of our meal, which is only a small sample of the goodness Garden Cafe has to offer. We started with Warm Walnut Mushroom Pate with Horseradish “Cream” Swirl, a rich, nutty paté served with warm homemade whole wheat foccacia. Super delicious, though it needed a touch of salt. Additionally, I had a Wolaver’s Alta Gracia Coffee Porter. Jaime ordered a vanilla coconut chai and it was delish. Next, the main course. We each ordered a dish and rotated clockwise when we had a sample of each. First up for me, Indian Vegetable & Chickpea Enchiladas with Bombay Sauce. Curried potatoes, chickpeas and a few other veggies, wrapped in a large enchilada (basically a burrito), drizzled with what I believe is a cashew cream sauce and a Bombay curry sauce. This is served with curried apple coconut salad and sautéed kale and onions. which are outstanding. This dish was everyone’s favorite. Next, the old standby: Grilled Curried Tofu Mango Sandwich. Mango chutney-like sauce on grilled tofu, caramelized onions, roasted red pepper and spiced veganaise (spelled the way it is said by every vegan in the universe on the menu) all pressed in toasted whole grain bread and served with small mesclun salad. Need I say more? Reliably fantastic. Moving on to a special, Jerk Tofu Salad. Jerk seasoned tofu over a bed of mesclun, drizzled with Dijon vinaigrette and served with whole wheat foccacia. I have to say, this was the dish I was looking forward to the most and I was a bit disappointed in the amount of jerkyness. While the tofu was tasty, it wasn’t what I expected. Not bad, especially if you are not into spicy food (which, as we all know, does NOT describe me). 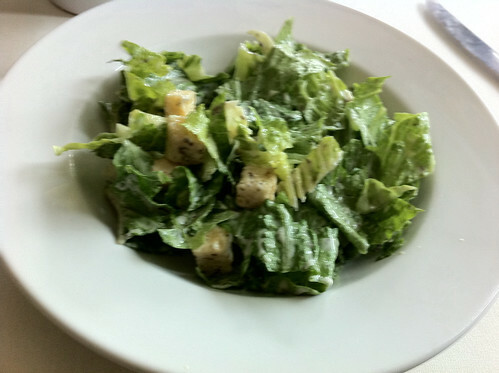 I would highly recommend the vegan Caesar over this salad, but it was nice to try something new. Finally, dessert. Another reliably good treat is the Warm Chocolate Brownie. 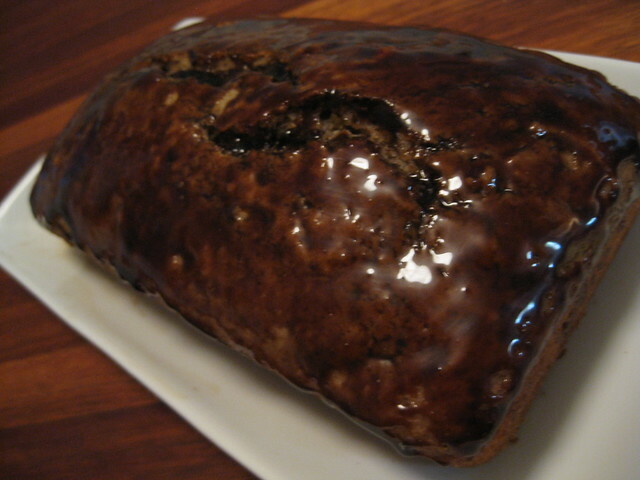 Rich and chocolatey, and not overly sweet. Covered in warm chocolate sauce and whipped cream. Paired well with my second Alta Gracia! A fantastic meal, as always. This place is truly one of the best. The only thing I think could be improved upon is the beer list, which has shrunk a bit over the years. Of course, this is a challenge when trying to offer only local and/or organic beers. Anyway, you will always find a decent beer (or wine, if you prefer) to enjoy your delicious meal with.